For years now manufacturers have been offering off the shelf accessories for the vast bulk of their range of motorcycles. On new models, just like at car dealers, a list of optional extras could be yours and all you have to do is tick a box to have them fitted. Since the boom of the custom motorcycle scene, it seems each manufacturer has expanded their list of factory custom parts to almost ridiculous proportions. But is it really the best way to get bang for your buck having just forked over an already large sum for a new machine? 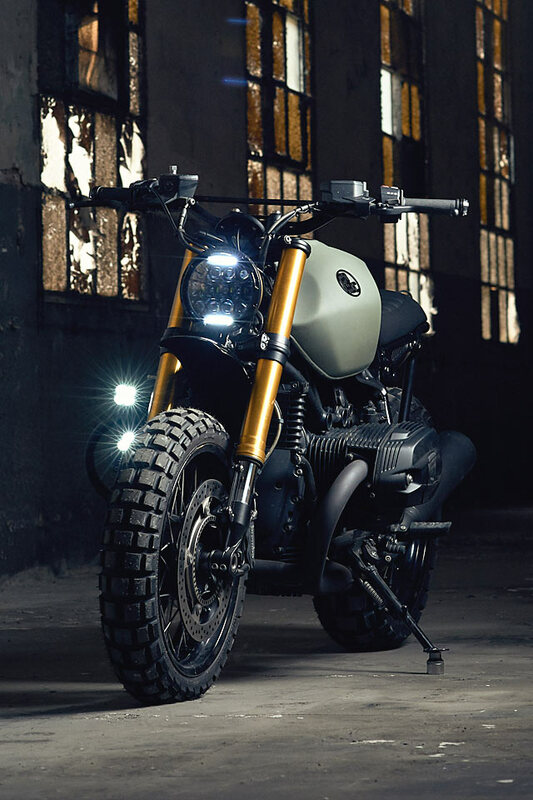 One buyer of a brand new BMW R nineT decided there was a better way, by throwing the keys to Spain’s Ad Hoc Cafe Racers and the resulting Scrambler more than proves the point. In the mountain’s overlooking Barcelona, David González has been plying his trade as a custom bike builder for a number of years, with this his 30th full build. Having tackled machines old and new, from just about every one of the big makers, he prefers to work slowly and get everything right. 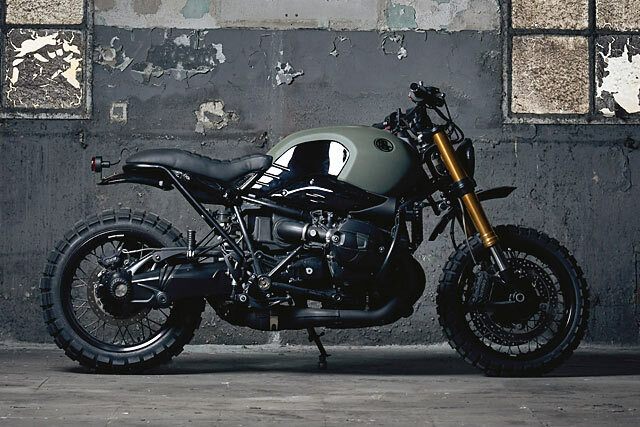 But this nineT was a little different, rather than spending his leftover money on some of the costly factory options the owner decided the cash would be better spent at Ad Hoc. 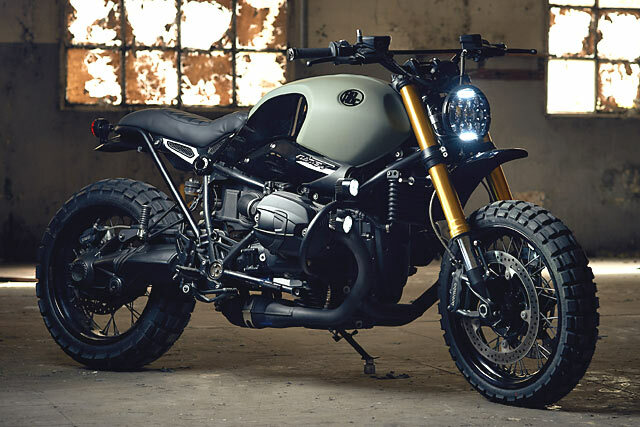 The logic was simple, the end result would be far cheaper (BMW doesn’t miss you on pricing) and the bike wouldn’t look or behave like any other spec’d up nineT. For David he saw it as “a small but effective restyling” and to deliver the result he “cut the budget and time as much as possible.” That said it’s obvious from any angle that an Ad Hoc budget build doesn’t cut any corners and the results are still phenomenal. The modular three-part rear frame meant disassembly was a snack and the design by eye process could begin. 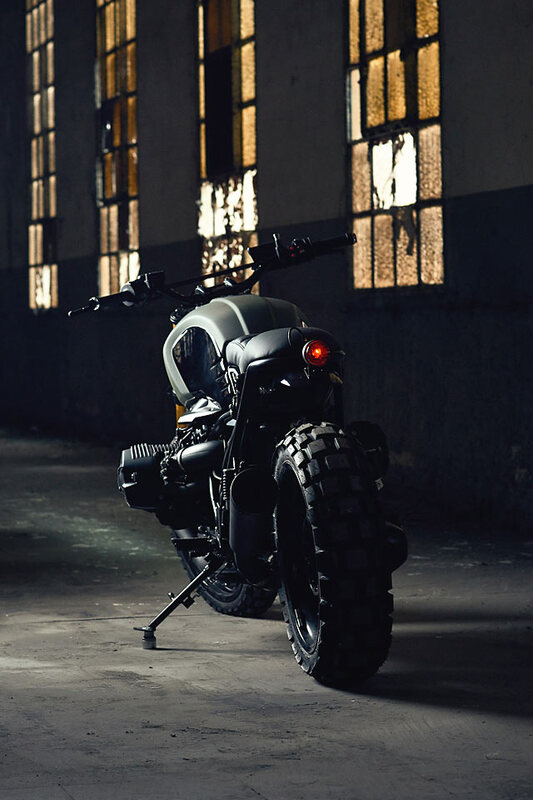 The entire shaft drive swingarm was coated in black to give the rear end more of an off-road vibe. 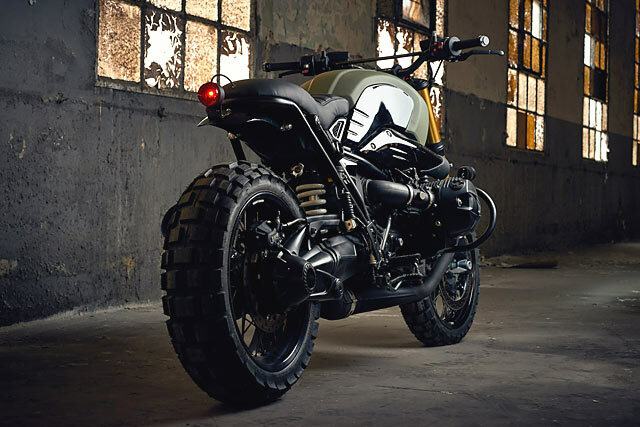 While to further enhance the BMW’s sturdy credentials that you’d expect of a scrambler David re-crafted the rear subframe from large diameter tube. The lines are not dissimilar to the factory metal work but the shorter rear hooped tail end gives a far stronger appearance. Watching the dollars was a key part of the build so the factory pillion peg supports were reused with the left side retaining the muffler support. The new metal work was all painted satin black to match the stock colour and perfectly blends in. To really get that scrambler feel and provide some protection from the mud David fabricated a pair of mud guards. These are finished in gloss black with the rear attached to the new tail hoop and the front getting high-mounted to the factory lower triple tree. 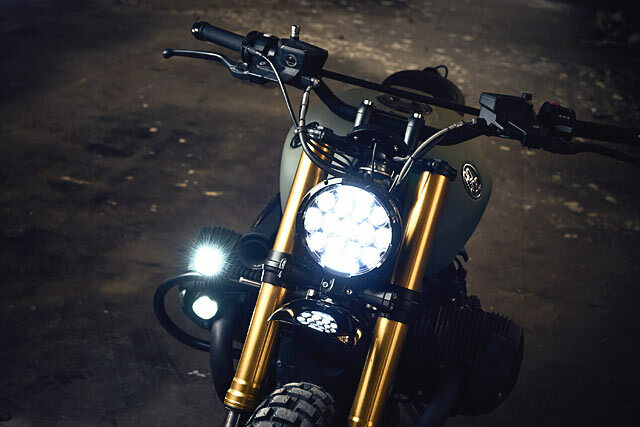 To finish off the scrambler look a new seat was stitched up from black leather and although capable of riding two up has a neat dip to allow the rider to sit securely for blasts on the mountains trails. Transforming the style of stock tanks is one of David’s signature skills and while not as radical as many an Ad Hoc build its light years ahead of any factory offering. To give a truly utilitarian look the primary colour is RAL code 7009 Gris Verdoso, or Green/Grey to you and me. This is offset by gloss black side panels on the tank and the same hue for the filler cap. The finishing touch comes in the form of laser cut Ad Hoc logos for each side. To give the controls the right feel the stock bars have been swapped out for a 28mm set of MotoX items with slightly less rise over standard. 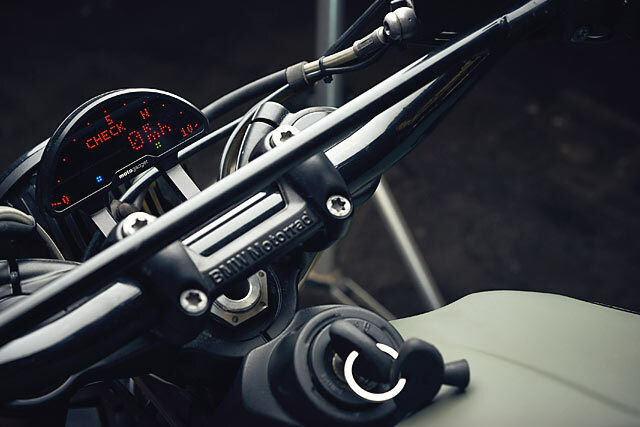 The bulky factory clocks are gone and so too the luxury of the factory heated grips. 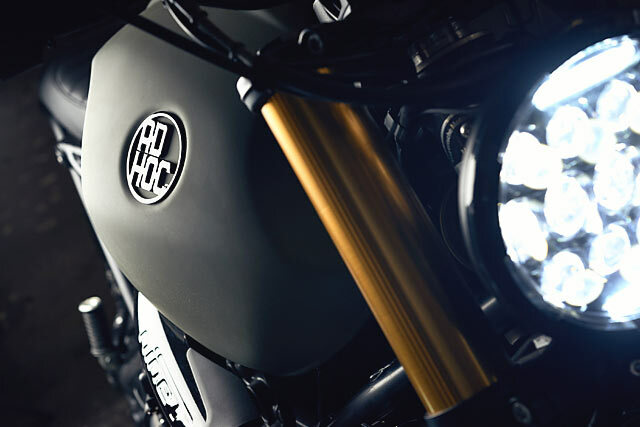 Feeding back the vital signs is a Motogadget Pro dash that is designed for the nineT providing a plug and play installation and neat fitment. 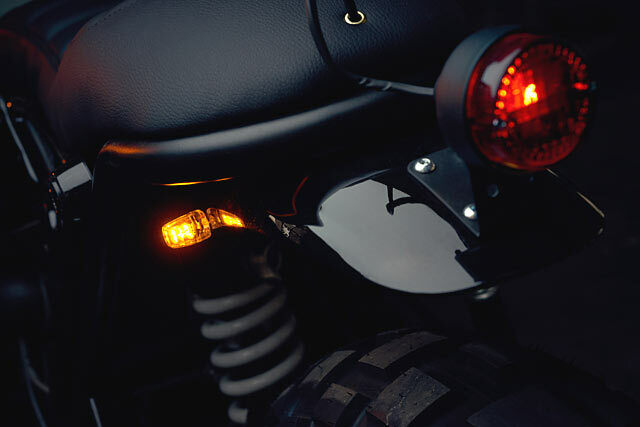 Motogadet also provided the bar end turn signals, while out back small LED items join a vintage taillight to keep it all street legal. The headlight was a feature David was determined to get right, a shallow depth LED item is neatly attached to the stock mounts and looks like an enormous hunting torch coming through the trees. The engine hasn’t been left unattended either, again budget constraints meant nothing over the top was planned but some weight could easily be saved. In lieu of the bulky twin muffler setup the scrambler’s system has been rationalised down to one and the full exhaust painted in black heat proof paint. Instead of ticking the box at the dealer for black cylinder head covers, a cool US$626, the customer instead had David paint them for a damn sight less. “As a wink to the old airheads we have built a cylinder protector on which we have installed a pair of long-range led lights,” explains David. While the finishing touch comes from ditching the factory road rubber for chunky Continental TKC80 dual sports. A clever choice as they are an OEM replacement tyre for much of BMW’s GS range and with a little time spent fine tuning the adjustable suspension David had the nineT dialed in! But he wasn’t quite finished there, to truly cater for his customers’ needs he built a second seat that he describes as more “family friendly” and added a set of foldable pillion pegs. 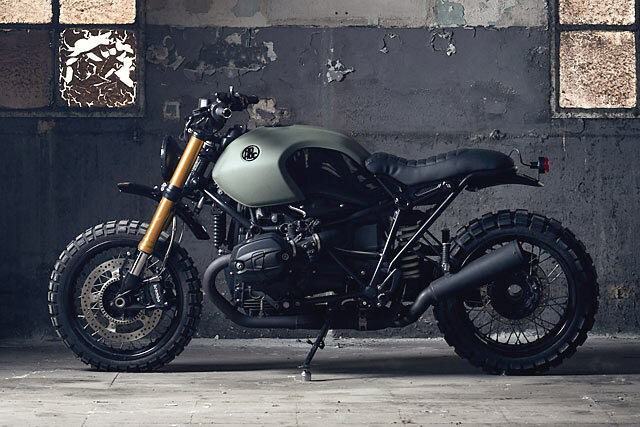 As they say, ‘Happy wife, happy life!’ But not only does she get to enjoy the new toy, all couldn’t be happier with the decision to let Ad Hoc spec up the BMW scrambler instead of the dealer. True personal touches at a cheaper price and you’ll never park next to another one like it. Bang for your buck never looked so good.